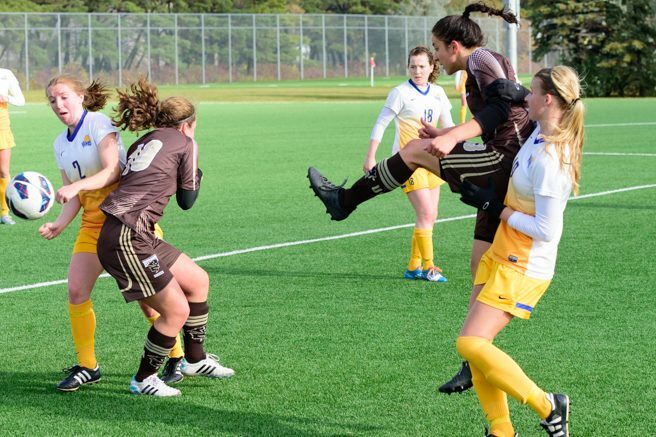 On Saturday, the University of Manitoba women’s soccer team upset the fifth-ranked Calgary Dinos 1-0 in their play-in match. The Bisons were able to shut out the Dinos, who have scored 47 goals in their 14 regular season games. The Bisons barely squeaked into the playoffs this season, finishing in the sixth and final playoff spot in the Prairie division thanks to their 2-0 victory over the Victoria Vikes last week. The Dinos, meanwhile, finished at the top of the Prairie division. This is the second time the two teams have met this season, with the Dinos getting the better of the Bisons 3-0 back on Sept. 25 in Calgary. The herd went into this playoff match as huge underdogs, but the team took their momentum from their final regular season game and brought it into this one. The first half of the game was low on scoring chances, especially for the Bisons. After the teams felt each other out, the game began to move a little more. The Dinos outshot the Bisons 12 to 2 in the half, forcing Bison keeper Maddie Wilford to make five big saves for the herd. The Dinos also had more opportunities on corner kicks than the Bisons, with five attempts to the Bisons’ one. The second half saw more chances for both sides. The Bisons had only two shots on goal in the half, but were able to find the back of the net on Rebecca Martin’s shot. Martin’s goal came off a rebound, as Dino goalie Sophia Traxler was able to stop the initial shot, but not the second. The goal came in the 48th minute to put the Bisons up 1-0, with plenty of time remaining. The Dinos played more aggressively for the rest of the game, as they were able to get eight shots on target in the half. But yet again, Wilford was sensational, stopping all the shots she faced. 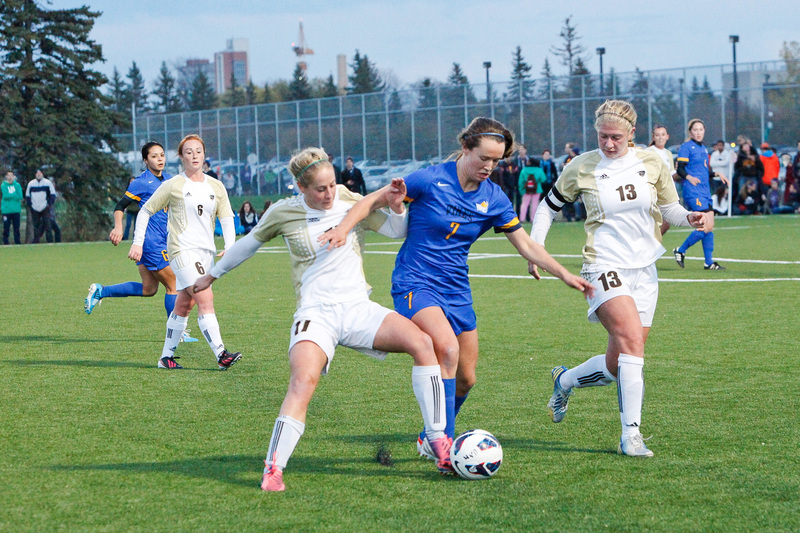 The Dinos also had seven corner kicks in the half, but the Bisons’ defense was able to get the ball out. The Dinos were relentless, but the Bisons’ defensive play was enough to shut the door. This was the Bisons’ first playoff win since 2008, and the third in their history. The herd now has a 3-5 record in postseason play, and hope to add to that this coming week, as they compete as part of the Canada West Select Six and attempt to keep their dream playoff run going. The Bisons will take the pitch in the Select Six tournament, which runs from Nov. 3 to Nov. 6, in Langley, British Columbia.